This is one of those weird non-Newtonian fluids - a strange substance that turns from an almost solid jelly to a scrunched-up smushy substance, like a broken jelly - and then back again when it settles after a few minutes. 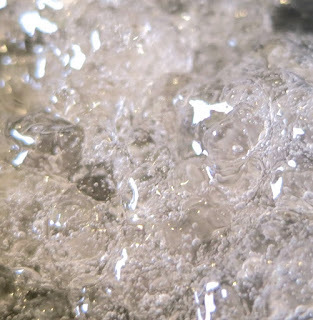 As it's a gel, it's nicely cooling on application. 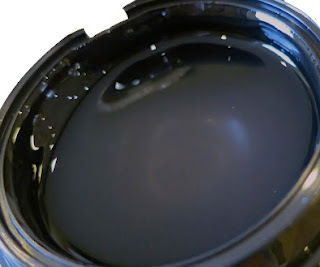 A pea-sized amount, applied over the face, is more than sufficient either as a primer in its own right, or as a step between moisturiser and primer. Great for hot and bothered skins, or hot climates, or hot environments, or sensitive skins. And why do we need to add yet another step to the morning routine, I wonder. Well, as most people who use Illamasqua's Skin Base foundation will know, it's one of those beautiful foundations which really only works for perfect skin (I call it a "goldilocks" foundation - it works when your skin is just right, not oily, not dry, not even combination - it shows up any dry patches on your skin quite noticably and can bunch and look patchy after a while (look here for my review), which is annoying). This is designed to work in tandem with the Skin Base foundation to prevent either of these from happening. Initially I wasn't sold. The first time I used it, I didn't notice any particular difference to my skin which was quite dry in parts at the time, and the combination of Hydra Veil + Skin Base foundation didn't make any difference; the dry patches still looked dry. However - and here's the weird bit - when I looked again in the mirror maybe an hour later, the dry flaky patches had completely disappeared. And every day since I haven't seen them return. 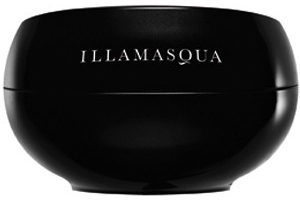 How to use it is a little confusing - Illamasqua's website indicates a pea-sized amount to be applied using a brush. The in-box instructions on the product's leaflet suggest fingers. Either works - fingers are simplest and fastest. It is supposed to give your skin a nice radiant finish - I can't honestly say that I've noticed this, however it most certainly makes foundation apply much easier than before, especially over dryer skin. And I have also found that I'm using a fraction of the foundation I used before, in addition (maybe a half to three-quarters as much). I have also found that makeup lasts significantly longer (with no creasing or fading or separating) using this as a base first. In terms of ingredients, it's water-based, so will work better with water-based foundations, and it will also work with silicone foundations - but don't use it if your foundation is oil- or wax- based. It doesn't contain any nasty ingredients (parabens) or flash-back ingredients (titanium dioxide etc), but it does contain some alcohol though, so watch out for this one if you're dry/sensitive skinned. The cynical amongst us could argue (in programming parlance) that this is Illamaqua fixing a bug in their existing Skin Base foundation by applying a patch, instead of a rewrite/reboot of the foundation, and then charging us additionally for the patch. Yep - I'm inclined to agree somewhat, except for the fact that it also works beautifully with other foundations I've tried it with. So in this instance I don't mind particularly. You may not need it, but if you do, it is a fantastic "fix". It retails at £27 for a 30ml tub, which comes with its own spatula - handy. Look here for more info. This sounds really interesting now need to debate whether to get it or not! I saw this on the website the other night when I was fighting to order my products in the sale! I had no clue what it was, so thanks for clearing that up! It looks like a really interesting product, and I use Skin Base every day so maybe it would suit me! Except Skin Base works perfectly with my skin type already so I don't know if I really need this stuff! Hey Annette, I think I spotted you on #irishbbloggers the other night - hi if so?! CAn you give me an example of wax/ oily foundation based? I don't know any..At least I think. Heya Virginie - no problems. The Giorgio Armani Maestro foundation is a good example of a fantastic oil-based foundation, it contains both volatile and non-volatile oils. Wax-based foundations tend to be more pro-centric; eg the Kett Fixx Cream, or the Maq Pro ranges. Hope this helps!